potatoes peeled and quartered - 5 lbs. white pepper - 1/2 tsp. 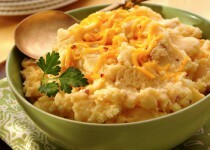 Garlic Mashed Potato Seasoning - 2 tbsp. butter melted - 2 oz. Garlic Mashed Potato Seasoning - 1/2 tsp. Prepare peppers and reserve all olive oil. Melt butter and mix in Potato Seasoning keeping warm. 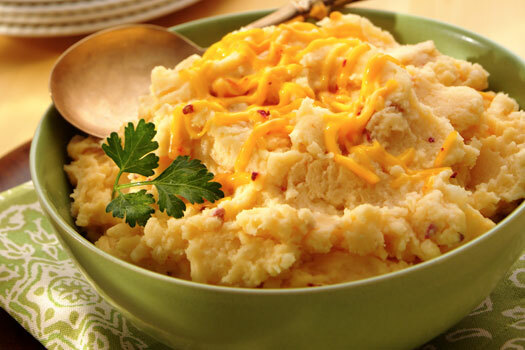 Pepper Olive Oil, white pepper, milk and mash (leave some potatoes in chunks). foil, bake another 10 minutes. Mix three ingredients, sprinkle on top of potatoes and bake as above.